This morning the L line was halted in NYC—my roommate and hundreds of desperate Williamsburg hipsters couldn't get into Manhattan. And while the subway is still great*, I wish we had Robot Taxis. These are just a concept by Czech firm Kubik Design. Their Robot Taxis are a (pretty) variation of something that has been in science-fiction novels and the trippy brains of those who have suffered and enjoyed the pain and advantages of public transportation forever. I want them. 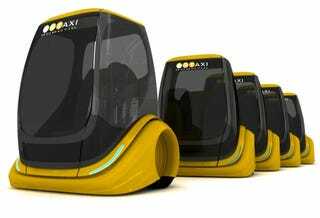 I don't need a car, I don't need the subway or the bus, just a whole network of these, electrically-powered low cost Robot Taxis. All of them always synchronized through any city, aware of each other. You can jump in one of them at any point and reach any destination in no time, door to door. All in one ever-evolving, always-self-adjusting, fully-optimized, and redundant public traffic system. * Great if you like missing appointments, enjoying other people's body odor, and experiencing 6G turns.